The UK remains at ‘Low Risk’ for Avian Flu with no further cases reported in domestic poultry in Europe, although some wild birds have been found in the Netherlands close to where the recent outbreak was. They ask that Poultry keepers remain vigilant and maintain good practice biosecurity. It was a great show, thank you to the organisers, and to the exhibitors who took the time to prepare and bring their birds! It was good to meet up with members who had travelled a long way to come and see the show. David, Herbie, and Ryan from Ireland and Pasi from Finland, it was great to see you along with all the other members who travelled from all over the UK. Edward was delighted with the overall condition of the turkeys and individuals received feedback on the judges’ comment cards. attached file regarding Avain Flu in Europe. 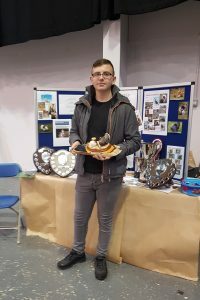 George has been showing birds from a young age, and at the National Show 2017 he also won Young Turkey Keeper. George was presented with a cheque for £50.00 and a ‘keepers’ trophy will be sent to him from Kelly Bronze Turkeys who have also donated the £50 cheque. Well done George we look forward to seeing you show in the adult section next year! The Hague – The Dutch government has ordered the country’s farmers to keep all poultry indoors after bird flu was discovered at a duck farm. 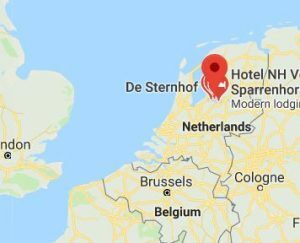 Authorities issued the order on Friday after a suspected highly pathogenic variant of the H5 bird flu was discovered at the farm in Biddinghuizen, about 70km east of Amsterdam. All 16 000 ducks at the farm will be culled. Zoos also have been ordered to prevent their birds from coming into contact with wild waterfowl. The Netherlands has a huge poultry industry, producing eggs and meat that are exported around the world. The Poultry Club Ladies Challenge Cup. Brenda and Ian Waterman won Reserve Champion with a British White hen. full results with pictures to follow…..
other news from the National ……. Jack Kileen was proposed and elected as the new President of the Turkey Club. The H5N8 strain of bird flu is currently circulating in Europe, with recent cases in poultry and wild birds in Italy, wild birds in Germany and poultry in Bulgaria. The current risk of incursion in the UK is medium for wild birds and low for poultry, although this depends on levels of biosecurity on individual premises. This is because the wild bird migration season is well under way, bringing birds from areas where we know bird flu is present to the UK for the winter.